Stylishly simple and wonderfully comfortable, the Brushed Steel Breakfast Bar Stool White is a fabulous addition to any room. A minimalist marvel with a modern sense of class and refinement, the Breakfast Bar Stool White is truly irresistible. Upholstered in soft, stylish white faux leather, the seat and backrest feature parallel stitched detailing, lending this model a truly elegant look. Both are cushioned using high-density padding for superior comfort. Hand-brushed, the one-column frame features a simple gas-lift for variable height, as well as 360-degree movement. A triangular footrest is incorporated for additional support. The brushed round base incorporates a rubber floor guard to help to keep your floors scuff-free. Arrived and put together, great service and excellent quality stools. I am truly delighted with the stools. Not only do they look smart in my new white kitchen, but they are comfortable and stable. I am a 73 year old pensioner but was able to assemble all three stools without help, only a man was used to tighten the bolts! The true test is two overweight pensioners able to sit comfortable and feel safe! I wholeheartedly recommend them. 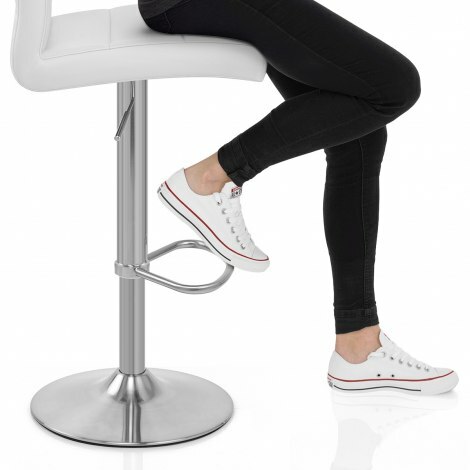 We ordered two of these breakfast bar stools. They arrived quickly and on time and were packed extremely carefully which immediately instilled confidence in our decision to buy from Atlantic. The stools were very easy to assemble and when done have a high quality feel to them. Excellent value for money and highly recommended. I needed a smaller chair for my computer which is in the kitchen/diner now we have downsized. Most were too high, and this one adjusted perfectly so it fits under my desk. It also looks very smart with the rest of the kitchen.